Cherry bombs. 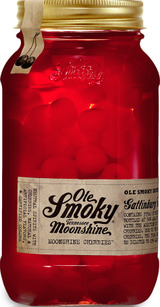 With a nod to Appalachian creativity, we took maraschino cherries and give them a good, long soak in our 100 proof original moonshine. This delicious marriage culminated in an explosion of sweet heat in every perfectly infused cherry. And, once the cherries are gone, the remaining moonshine offers a lingering sweet nectar that blends into cherry cola or ginger ale like long lost lovers.